The European Union has approved a copyright rule that aims to give more protection to artists and news organizations but which critics say will stifle freedom of speech and online creativity and punish smaller web companies. Here’s a look at key issues. The most vigorously debated part of the legislation is a section that makes companies responsible for making sure that copyrighted material isn’t uploaded to their platforms without permission from the original creator. It puts the legal onus on platforms to prevent copyright infringement but critics say it will end up having a chilling effect on freedom of expression on the internet and could result in censorship. Some sites would be forced to license music or videos. If not, sites would have to make sure they don’t have unauthorized copyrighted material. Critics worry that could lead to costly automatic filtering. And paying for links could create further costs. Some consumers worry that the new rules would bring an end to parodies and viral internet “memes” that have powered online culture and are often based on or inspired by existing songs or movies or other content. The EU denies this. Some authors and artists fear they won’t earn significantly more money but their creativity will be stifled. Google estimates it has paid out more than $3 billion to rights holders through its Content ID system, which was created in 2007. But many appear worried it will change the internet as we know it. More than 5.2 million people signed an online petition against the directive. 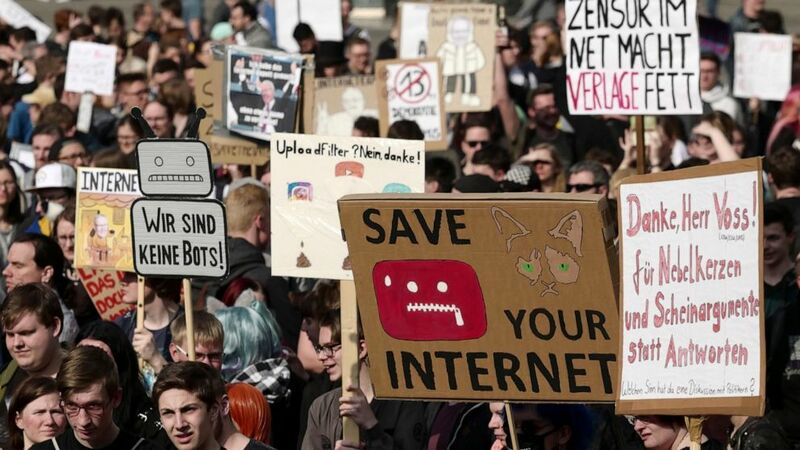 Internet luminaries such as Tim Berners-Lee, the inventor of the World Wide Web, and Wikipedia co-founder Jimmy Wales have spoken out against it. So has the former frontman for the band Fugees, Wyclef Jean, who has said he is better off financially because fans can freely share his music on internet platforms. Last month, tens of thousands of people marched in cities across Germany to protest against the directive. Wikipedia’s German-language page was temporarily blacked out in protest and visitors were greeted with a statement from online encyclopedia authors urging them to ask their EU lawmakers to stop the bill. Poland’s leader has said his country will not implement the directive, arguing it threatens freedom of speech. The EU’s member countries have two years to comply with the directive by drafting their own national laws. Six countries — Italy, Sweden, Poland, Finland, the Netherlands and Luxembourg — voted against it, so implementation is likely to be uneven, setting the stage for legal challenges.